Kitchen island is one of crucial elements of kitchen set that has been designed in various models. 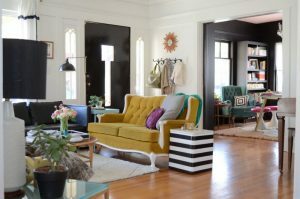 It can be fun, smart, functional, and stylish, so we can use it as the part of lifestyle, especially the lifestyle that’s closely related to interior design. Interestingly, there are so many options of kitchen island which are equipped with storage and seating unit. These options possibly make us, the users, feel more practical and comfortable when we’re using our kitchen island. We all know that the kitchen island is multi-functional item. It can be a working table, prep. 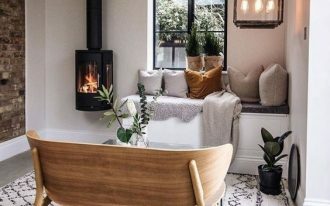 table, breakfast nook, and even an inviting spot specially when it is designed for friends, family, or guests to pull a stool up and then enjoy some cups of coffee or tea. 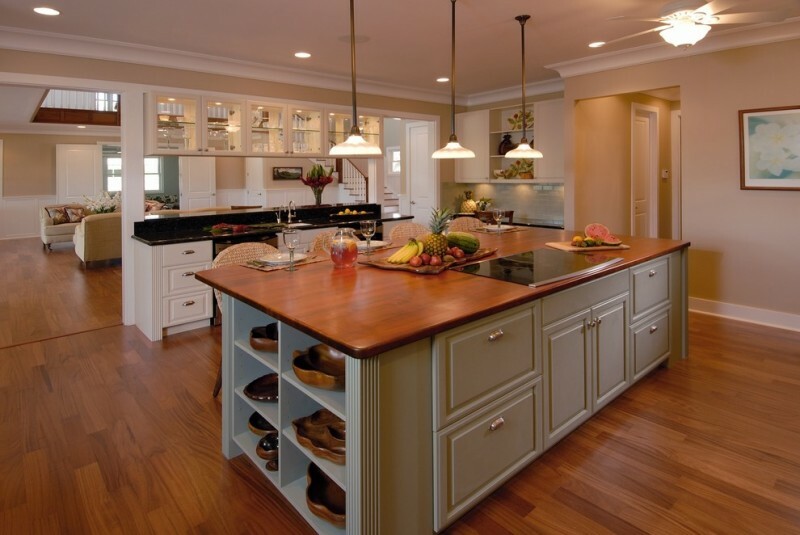 Then, what are the best kitchen islands with storage and seating to outfit our kitchen? The following ideas may be your inspiration. 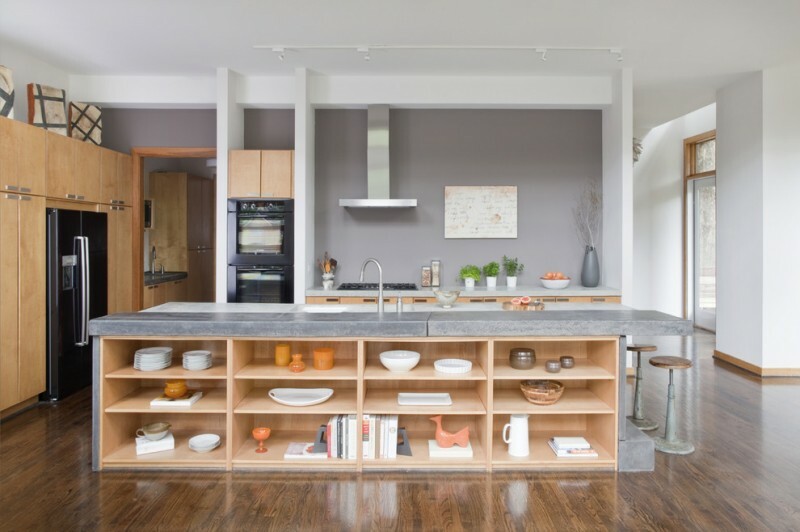 Side shelves and storage in this kitchen island offer easy and practical way to store. Such idea, of course, makes us easier when we need the storage system while prep. foods or any activities at the kitchen island. Monochromatic always be endless trend and can be applied for any fields, including the interior design. 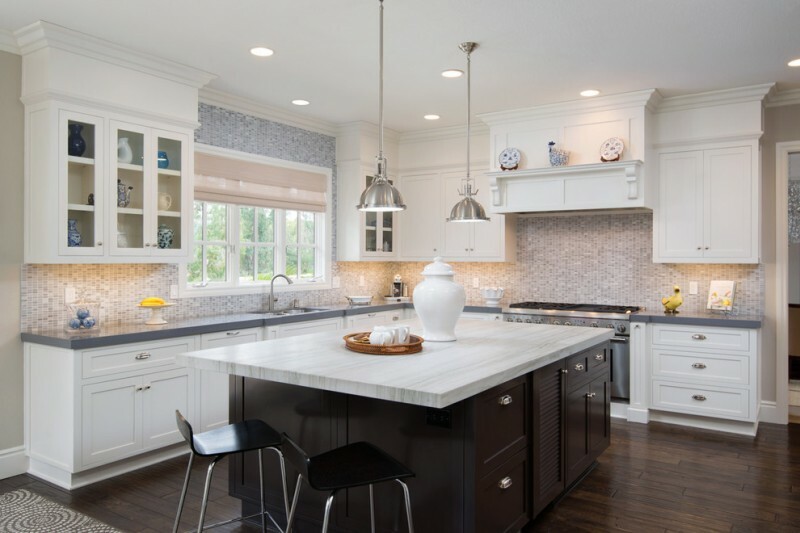 This kitchen island, for instance, has been designed in two major color tones: white and black (monochromatic tone). The kitchen island has the wine storage as the accent as well as the functional outfit. Its modern design is always stunning and potentially invites everyone visiting this cooking spot. Look at the design, it’s so inviting. Isn’t it? 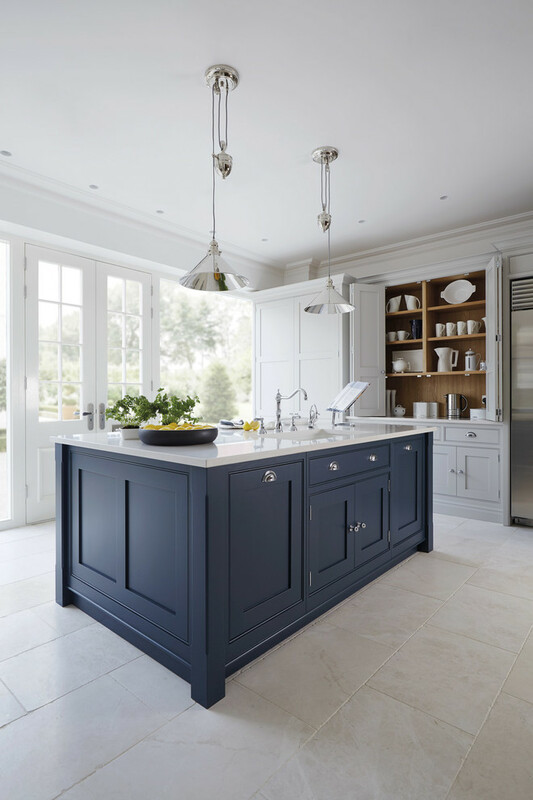 Navy blue for the base and white for the top are chosen to make this kitchen island looks most striking among the others. 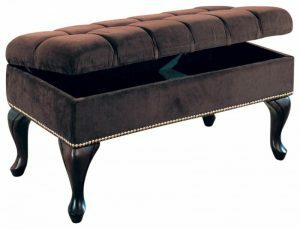 Not only the color choice, another attractiveness of this table is the storage system which is available for kitchenware, tableware, wines, or just decorative items. L-shape kitchen island here is an extended version. There are two main areas of table: a table as the prep/ working table and another is a breakfast bar. This design is really interesting and space-efficient as it accommodates more than one function. The kitchen island is also more than just the prep. table, the designer has equipped it with the functional as well as decorative storage space for wines or ornamental tableware. A curved kitchen island with pull-out cabinets and shelves – Such idea actually suits for an open-concept kitchen design as it requires larger space to be built. This kitchen island has most completed functions: as a prep.table, breakfast/ dinner nook, and working/ conversation corner. 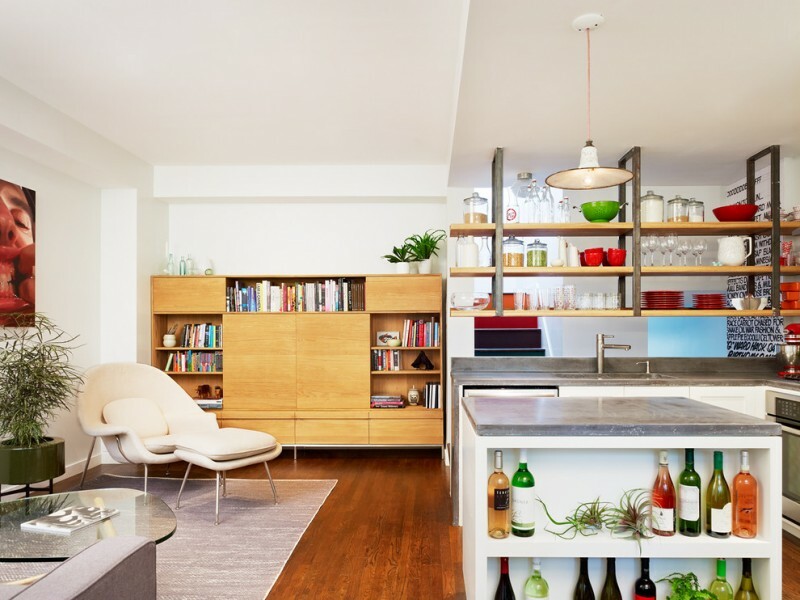 Each area also features the storage system like the pull-out cabinets-drawers and curved-shaped open shelves. And, of course we love the sky light. 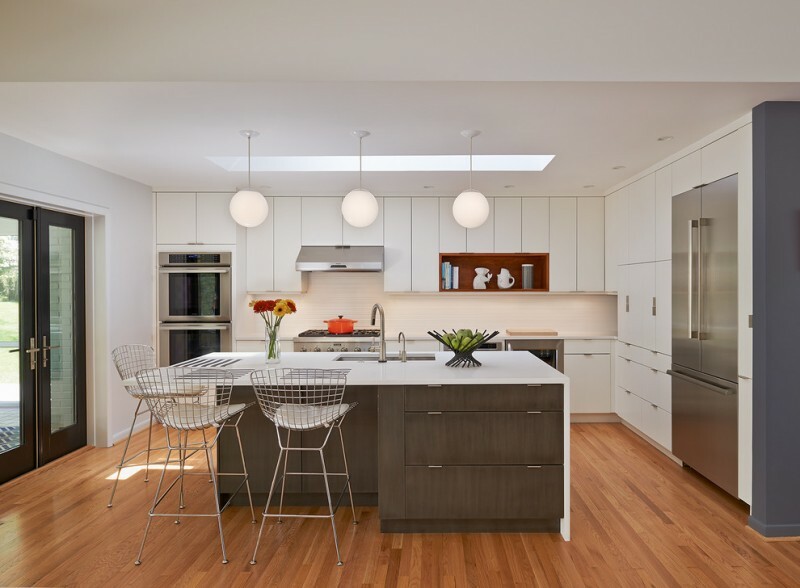 It always provides the natural lights for everything under it, including the kitchen island which is dramatically illuminated by warming sunlight. 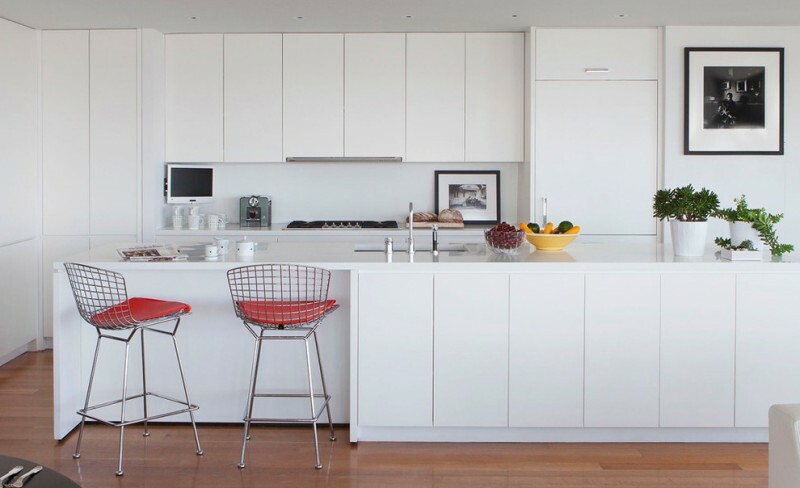 A simple white kitchen island with storage and a couple of chairs – It’s a center of attention. 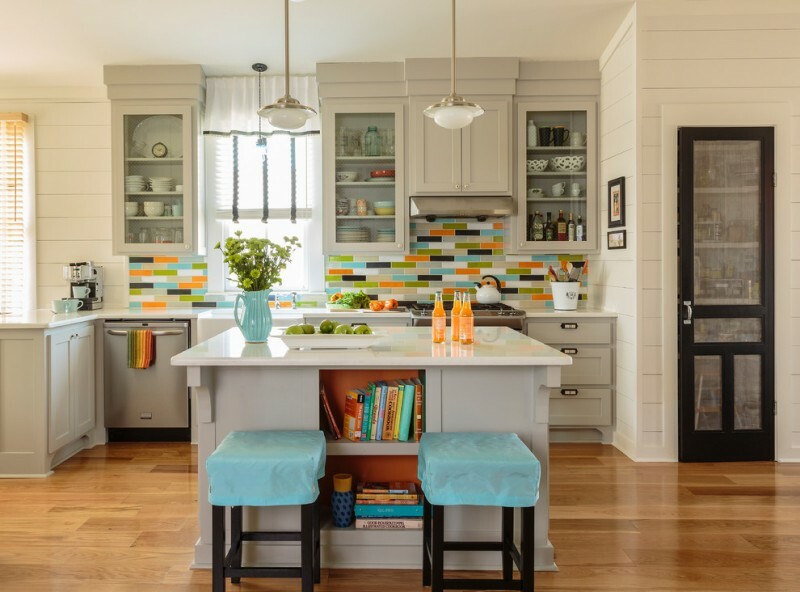 Its color tone matches the overall kitchen design. The chairs, otherwise, are the exposed wood chairs supported by metal structure. With different color tone, the homeowner wants to expose the chairs as the focal points. It’s a inspiration for you, book lovers. Why? 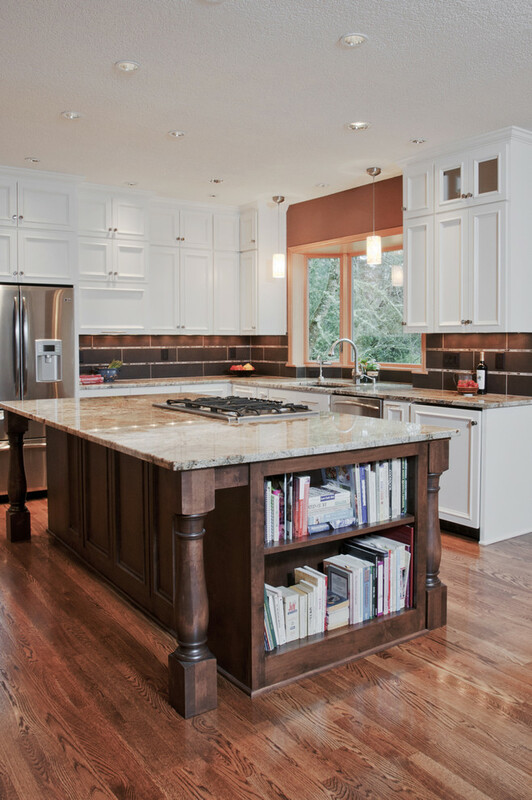 This kitchen island has been completed with side book shelves where we can put and organize our book collections or recipe books here. It must be fun to do two hobbies: cooking & reading at the same time. Isn’t it? 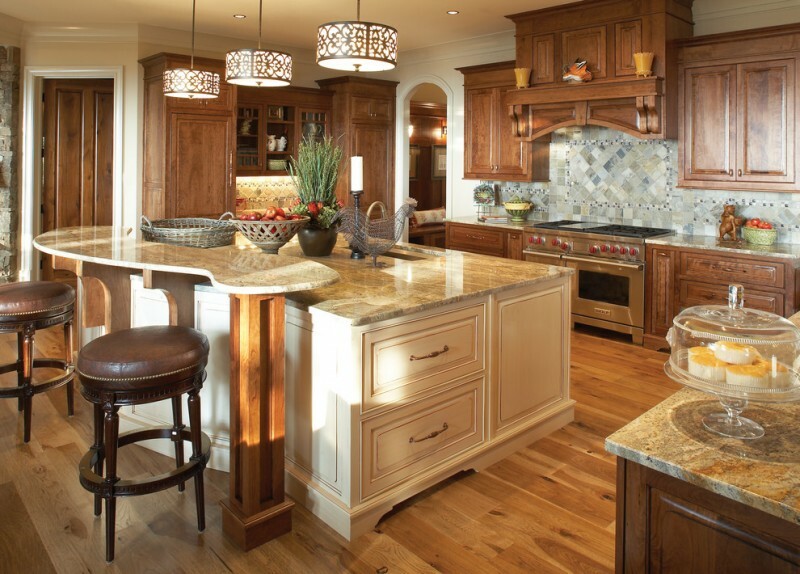 The kitchen island is originally made of dark-toned wood, the same material of kitchen cabinets. 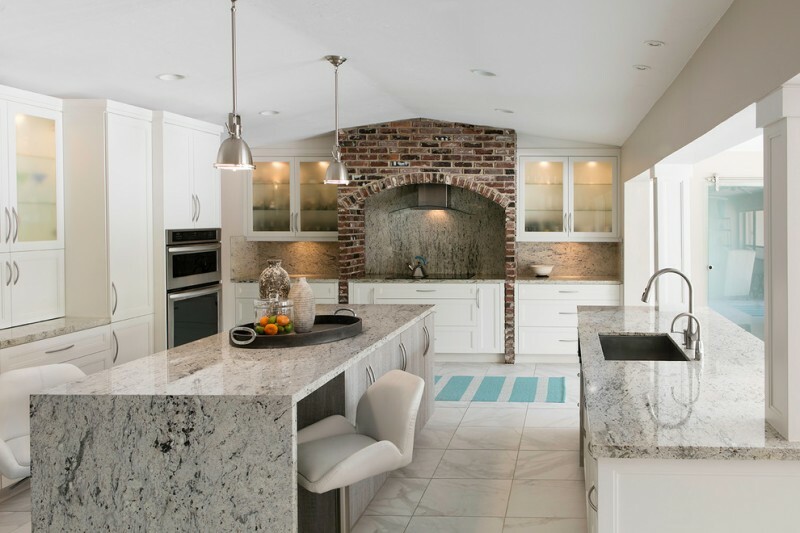 The designer, then, features it with luxurious white granite for the top and completes it with undermount stainless steel sink plus its faucet. As the breakfast nook, some stools or chairs are added. 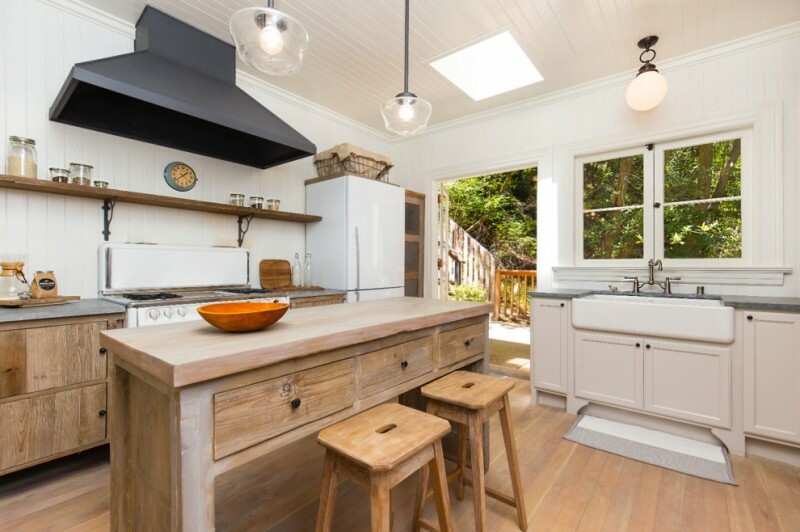 For efficiency, the island is equipped with pull-out cabinets and drawers as the storage space. 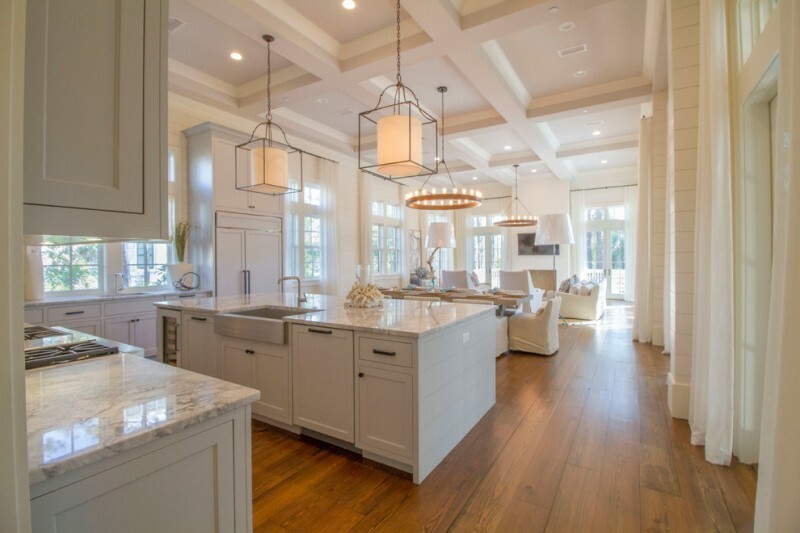 The kitchen island is really lovely. The base and top colors are balanced each other. Raised-panels on its cabinets are also stunning as they’re finished in gold tone. Also, according to the color tone, the island is the most distinctive one whereas the other kitchen furniture items are designed in white. Overall, the kitchen island has been a focal point. 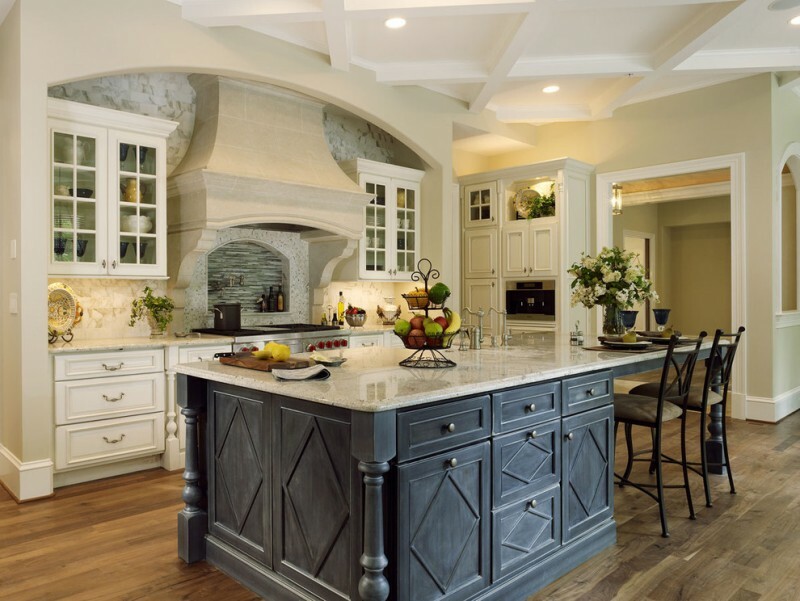 Shabby but elegant – two words depicting this kitchen island. 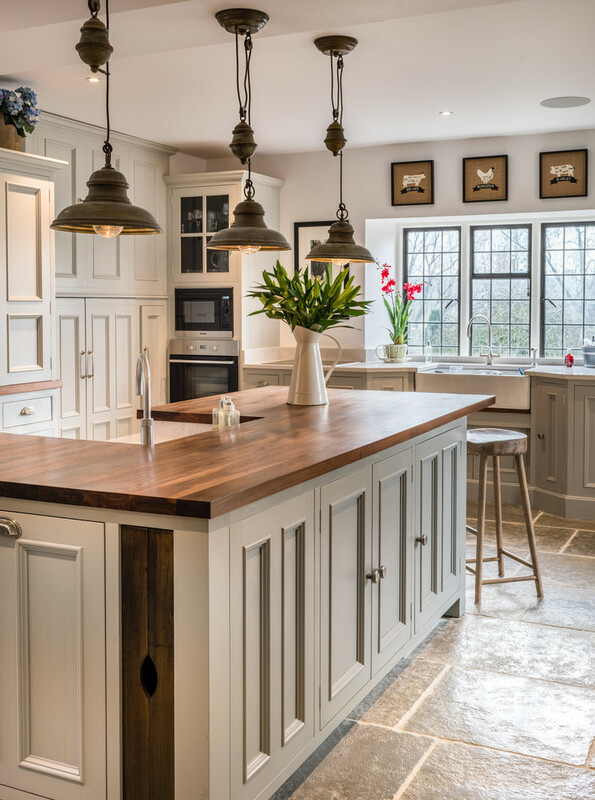 The kitchen island is supported with raised-panel cabinets and finished in dark wood – giving a rustic look. 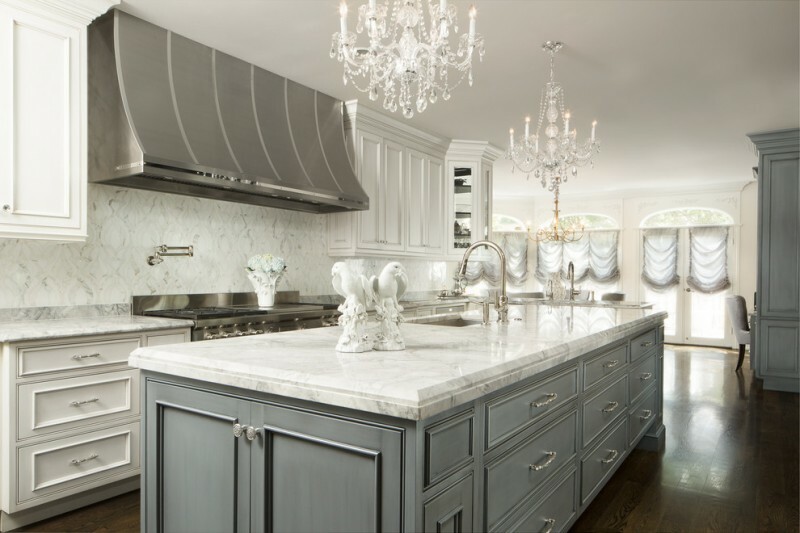 The top/ surface of island is made of solid and clear & gloss-finished material, so it looks expensive and luxurious. The extended surface, in addition, is used as the bar table. Just pair it off with the chairs or stools. 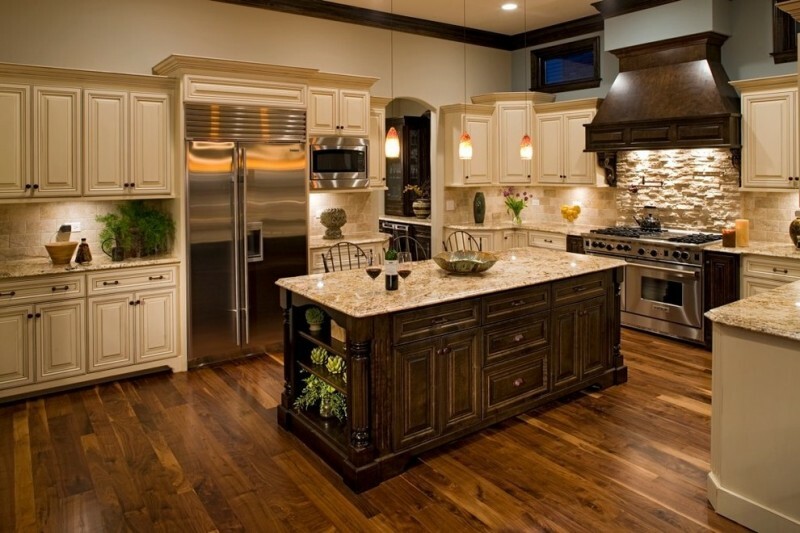 Use darker color tone if you want to add an antique, shabby, and old look in your contemporary kitchen. Apply this idea to your kitchen island and you’ll see an amazing result! Like in this picture, the dark-toned wood kitchen island has successfully given shabbier appearance among other modern kitchen furniture. The same look also works well for the chairs which are then paired off with the extended island’s top. 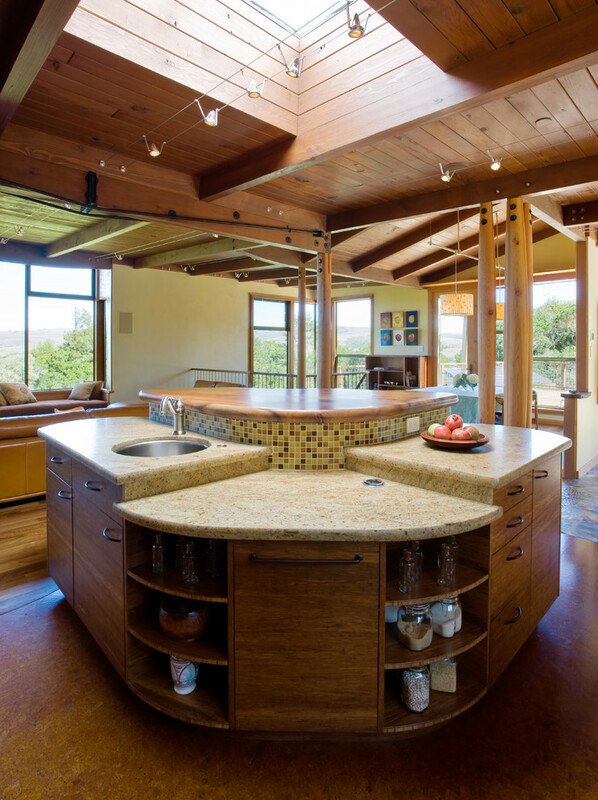 An kitchen island with elevated top addition – Such design is awesome and rarely to find. The elevated top here is used as the bar table/ breakfast nook. We just need to pair it off with the stools or high-foot chairs. 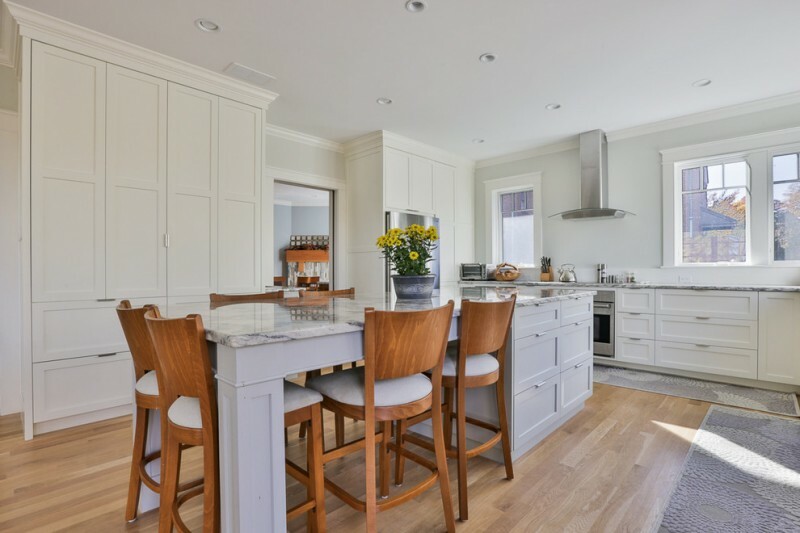 The kitchen island also has the additional feature of storage, so we can use it for storing kitchenware, tableware, or other items usually used for cooking or serving meals. 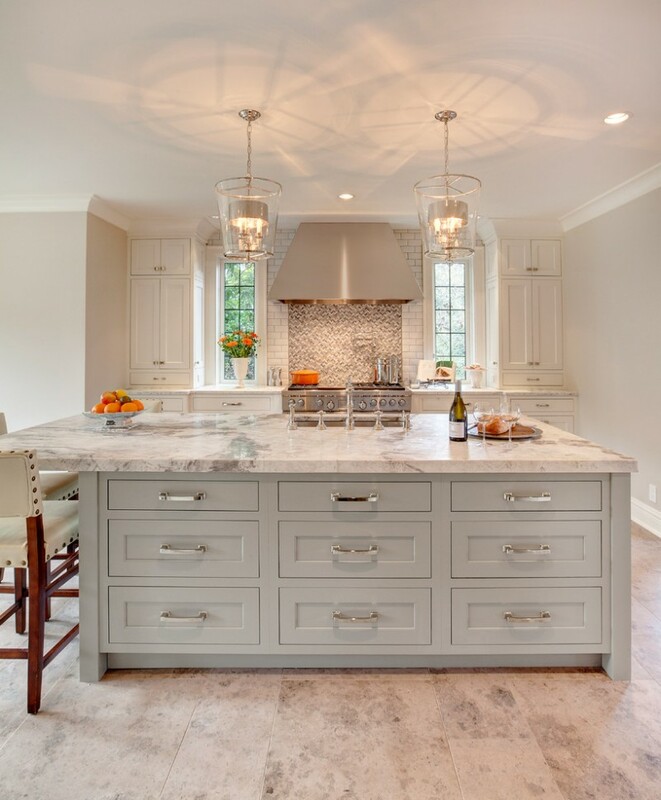 A kitchen island with grey for base and white marble for top – a perfect color collaboration. This idea surely fits for dominant-white kitchen. 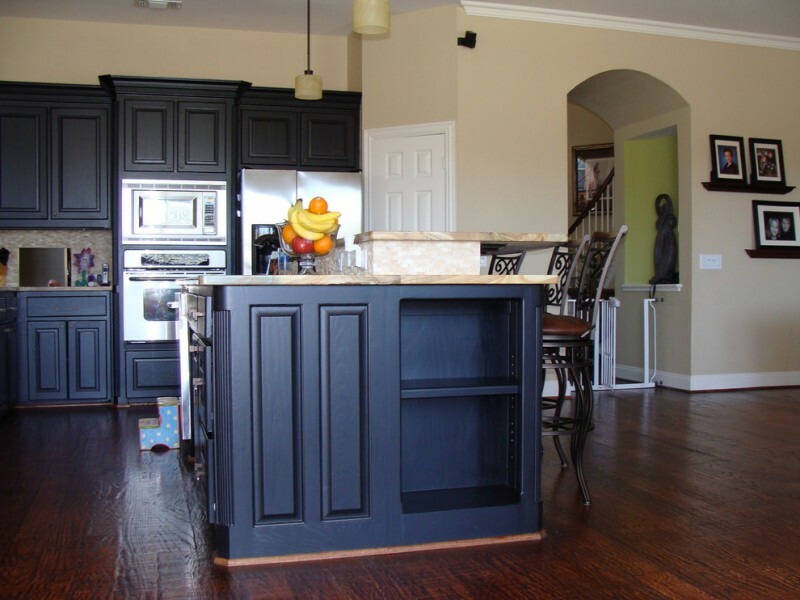 Use darker tone of colors like dark hardwood floors to get rid of pale or monotone look. 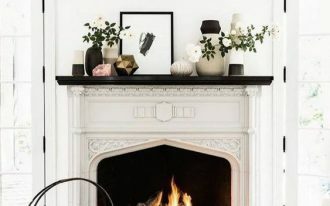 Or, use white for emphasizing the dominance of white color in this room (white for chairs, may be). 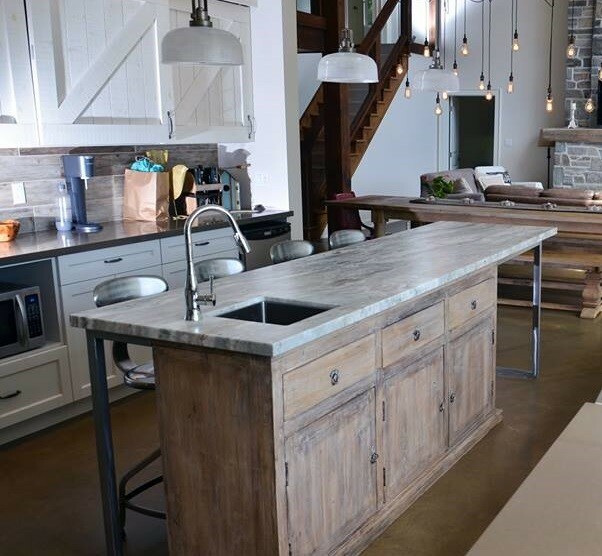 Love this rustic kitchen island. It’s so stunning and helps the users related to storage space. 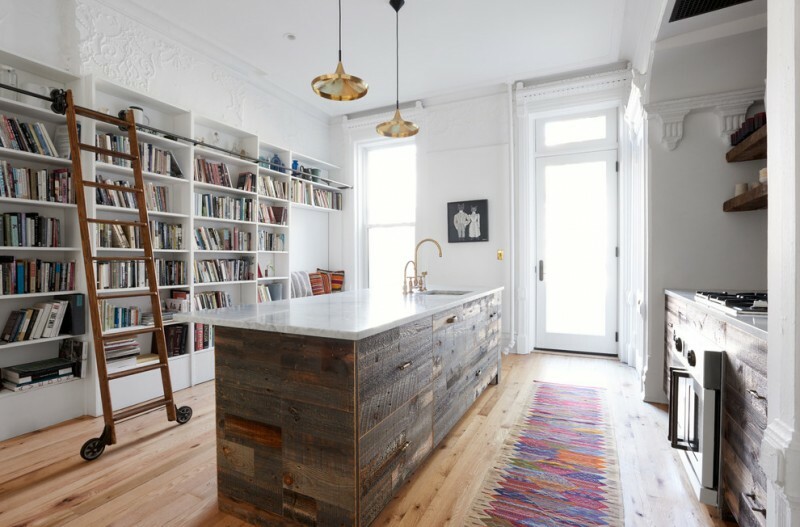 The kitchen island is integrated with a kind of buffet which is made of reclaimed wood. At glance, it looks like a buffet which then is turned into a rustic kitchen island just by adding the custom metal frame into its back. Overall, it’s so sophisticated and casual. We find a perfect contrasting neutral elements and textures which are mixed with hard metal. This mixture helps in keeping the style of strong piece as well as family-friendly. This kitchen island is colored in soft grey and uses granite for the worktop. 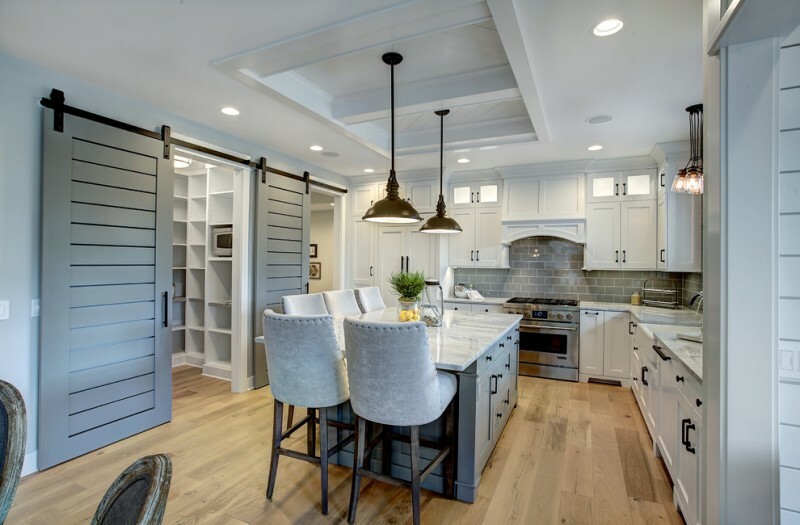 The base, in addition, is attached with multifunctional storage spaces like cabinets and drawer systems, so they’re so useful if the homeowner needs more spaces for storage. A kitchen island with a lovely worktop! The worktop is built from one of granite kinds, stonewood granite. This worktop choice, of course, adds special interest, while white kitchen island’s base gives a contrasting look. Attractively, we’ll find the storage built in the kitchen island. With raised panel handles, it’s so easy to pull them out and we’ll discover the huge space of storage. 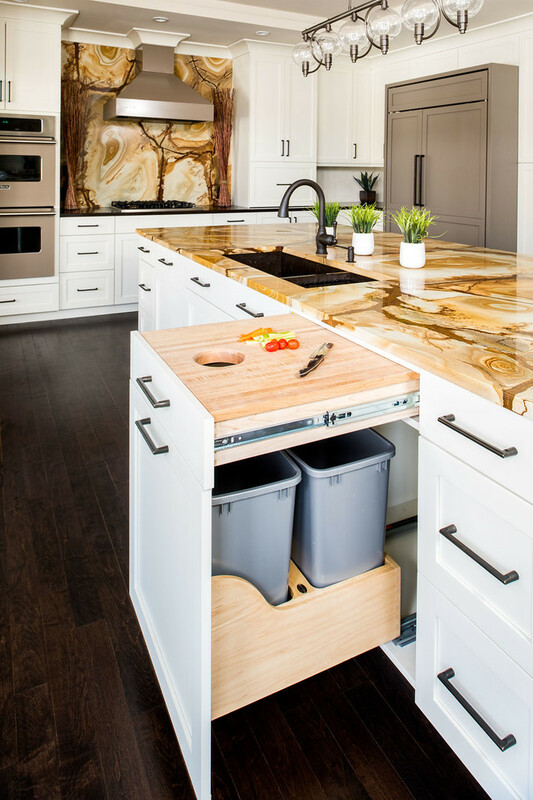 Not only that, the kitchen island has been featured with the trash bins and cutting board which are integrated into the worktop. That’s so practical and functional, right? Simple, casual, and modern – this is the first impression when we’re observing this kitchen island. 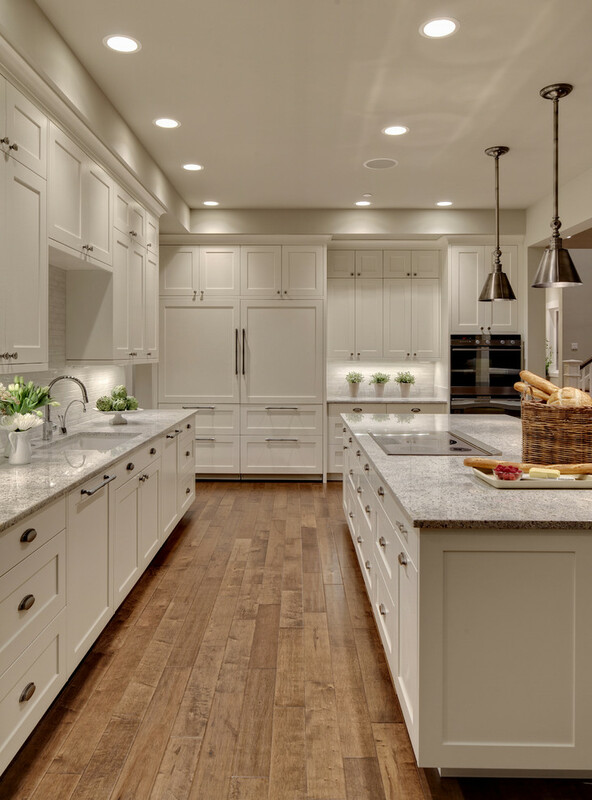 The kitchen island is dominated by white color tone and it features other white-colored cook kitchen, bringing a perfect balance and simplicity. The color choices, white and wood colors, help creating the natural lighting effect in room. This kitchen island is really lovable. The airy white is well combined with tone of light wood. The kitchen island is clearly dominated by white, including the worktop and under storage system. 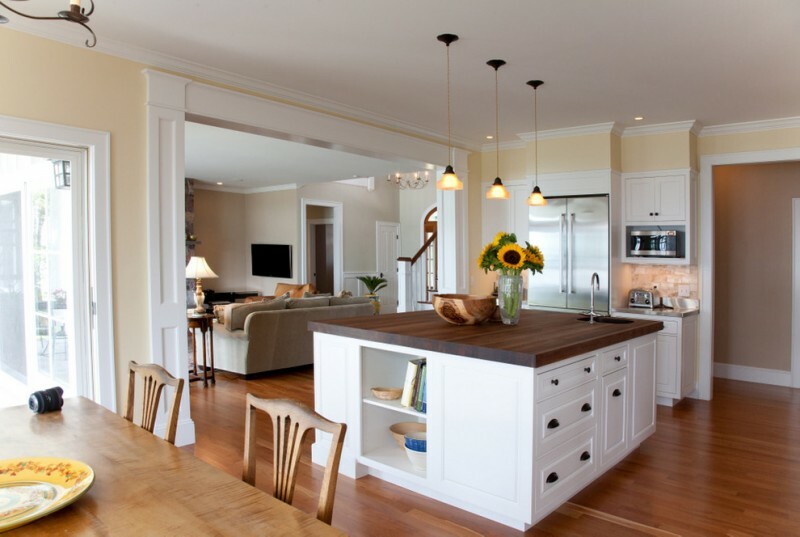 Both the kitchen island and wood-foot chairs are then paired off, resulting different but balanced look. Red kitchen island with shaker cabinets – a great choice for you who love vivid and deep color tone application. Feature it with dark-toned worktop like this black marble worktop to create a beautifully contrast. Add tiny white frames for the shaker cabinets for accenting the storage units. With this idea, it’ll be a stunning and stylish kitchen island. A kitchen island featuring with luxurious chairs – this is an elegant and classy combination. Both use similar color tones: light blue accented by solid black. These color choices create calm and soft look. The designer collaborates them with something natural which is represented by wood floors. It seems that natural and fabricated elements in one and balance each other. White marble worktop covers the overall surface of the kitchen island, giving expensive and classy look to this kitchen property. The island, also, has a drawer system for storage. To keep them elegant, the designer chooses glowing chrome handles attached onto each drawer unit. Light blue is also selected to layer the whole storage’s body, giving much more elegance and luxury to the kitchen island itself. Wood kitchen island collaborated with simple white storage – this kitchen unit offers simplicity by emphasizing the natural material as the main element in the kitchen. It can clearly be seen from the island’s worktop that’s set without finishing. The bar stool also keep existing its main material, the hard wood. 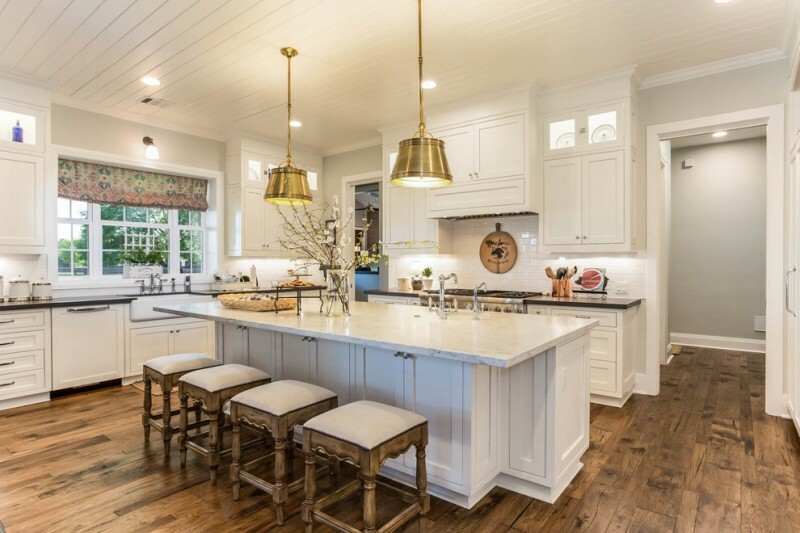 Clean white kitchen island – It is completed with amount options of storage and farmhouse sink, an ideal unit that not merely provides huge space of storage and washing needs, but also offers us a stylish unit of kitchen island. Dark blue cabinet storage is the concealed storage unit that perfectly completes the kitchen. It looks so striking with metal handles addition. The top of island is solid white marble, an expensive and luxurious worktop choice. 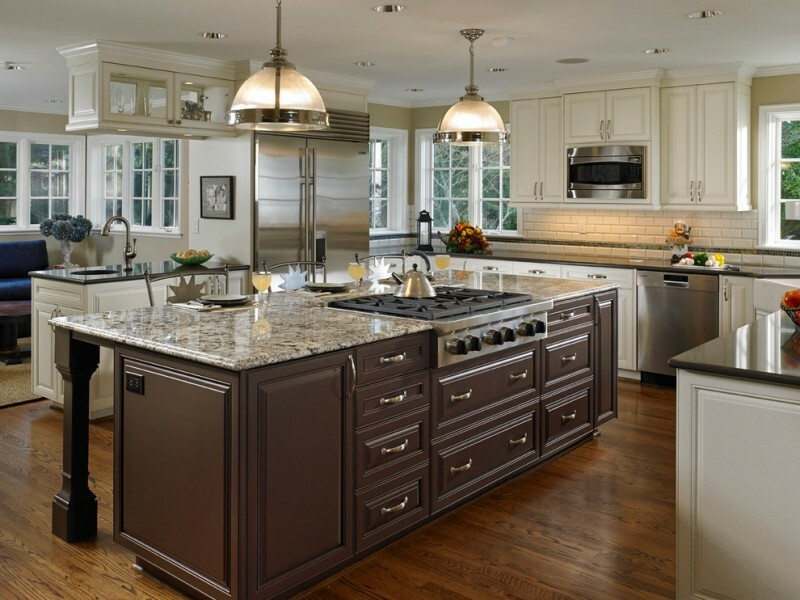 With different color tone, the island is aimed at becoming a focal point of room. This dark wood kitchen island is collaborated with clean white marble worktop, a perfect color combination that then results a contrasting look. 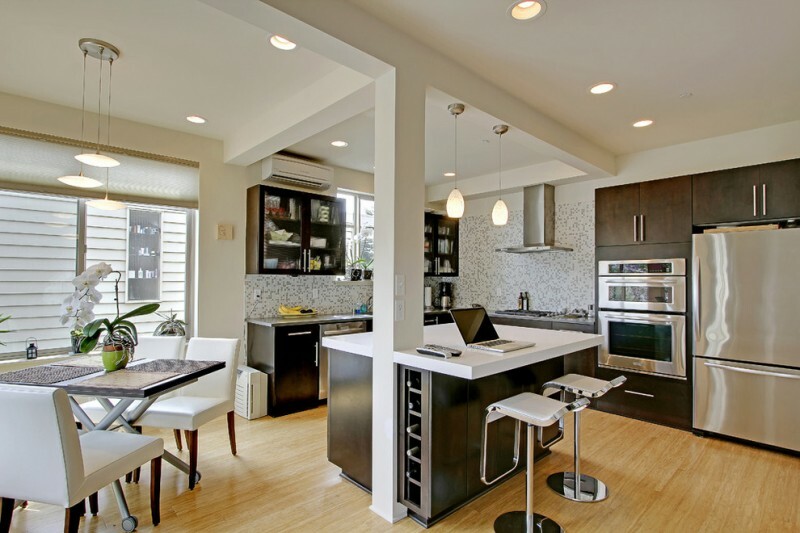 The owner features it with a couple modern black bar stools to optimize its function. These stools, of course, are set to provide a cozy and stylish seating area. 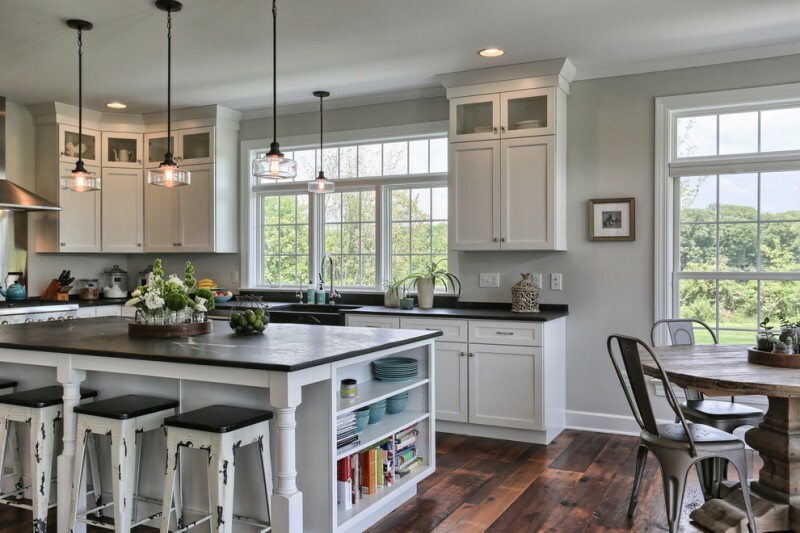 Mid-sized kitchen island is the best option for a limited kitchen. This idea of kitchen island is one of examples that offers a practical storage space without ignoring the updated design. It’s minimalist but available for storing the numbers of books, recipe books, magazines, or other published papers. This island is also multi-function: as a prep.table as well as a eat-in table/ breakfast table. This simple kitchen island offers practical and space-efficient use. 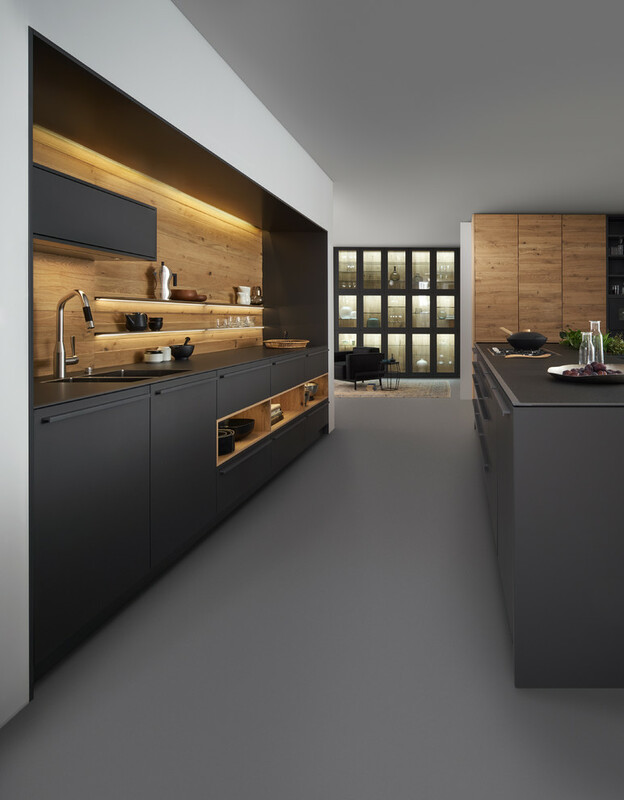 It uses black solid worktop and white cabinets as the storage. 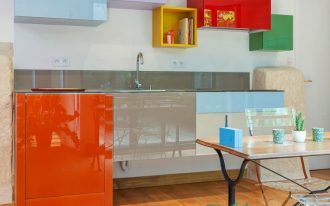 Both design and color has similar theme to kitchen countertop, giving a harmonious look in room. A kitchen island with walnut-made worktop – it’s so durable but still warm in look. Such kind of island design gives an inviting worktop for preparing everything before starting to cook. The surface is also so stylish, even more it’s supported by clean white base equipped with white cabinets. Wood-top kitchen island with storage – Such small kitchen island with storage addition becomes the best alternative for a kitchen with limited space. With matching color and design, it’s gonna be a functional as well as stylish spot where we could welcome our guests or family while preparing or cooking special dishes. Gloss concrete-top kitchen island is unique, a potential room anchor if we feature it with other matching material. 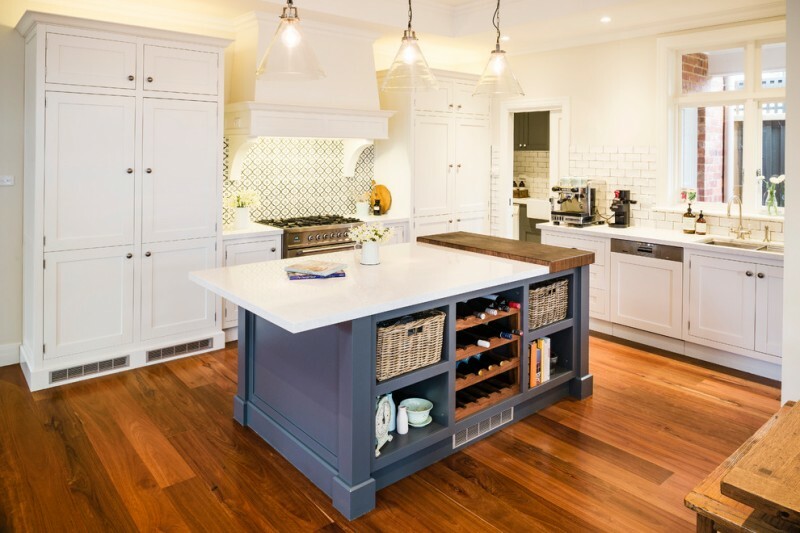 This island can be a practical storage space as it’s facilitated with a numbers of open shelves. This open shelf is an interesting display spot where we can expose our decorative tableware collections. Small-size kitchen island completed with custom wine rack – its open rack which is mounted on metal worktop can be used for serving the dishes and providing the lights from a hang lamp over it. A mixture of dark and light (monochromatic) – this color mixture is well-applied on this modern minimalist kitchen island. The island includes large open shelves which are available for displaying as well as saving cooking utilities. Such kitchen island expresses an edgy but serious. The island’s top is white marble, similar material of kitchen countertop which always exposes ultimate luxury and elegance. 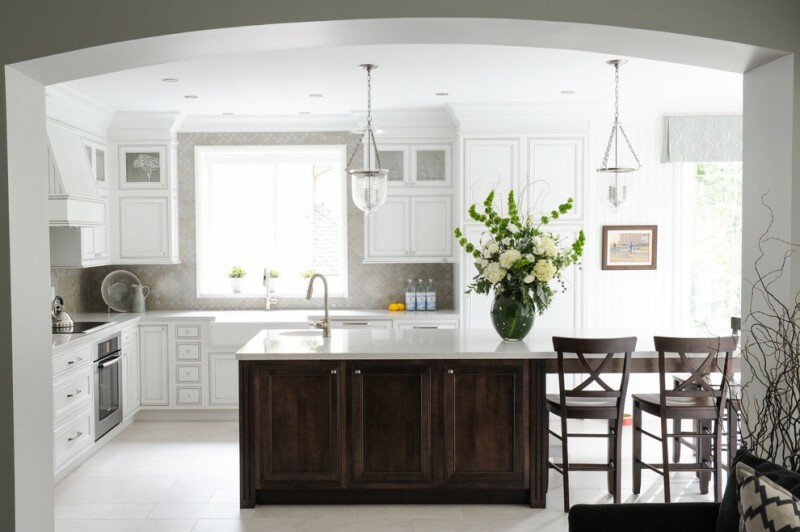 Grey cabinets included in the island add a beautiful contrasting look. Metal handles are added as the accessories as well as the functional item for each unit of cabinet. This kitchen island features granite worktop, dark hardwood cabinets underneath, and side open shelves for storing fresh supplies like vegetables and fruits. The color and ambient lighting choices are apparent to semi-rustic look. 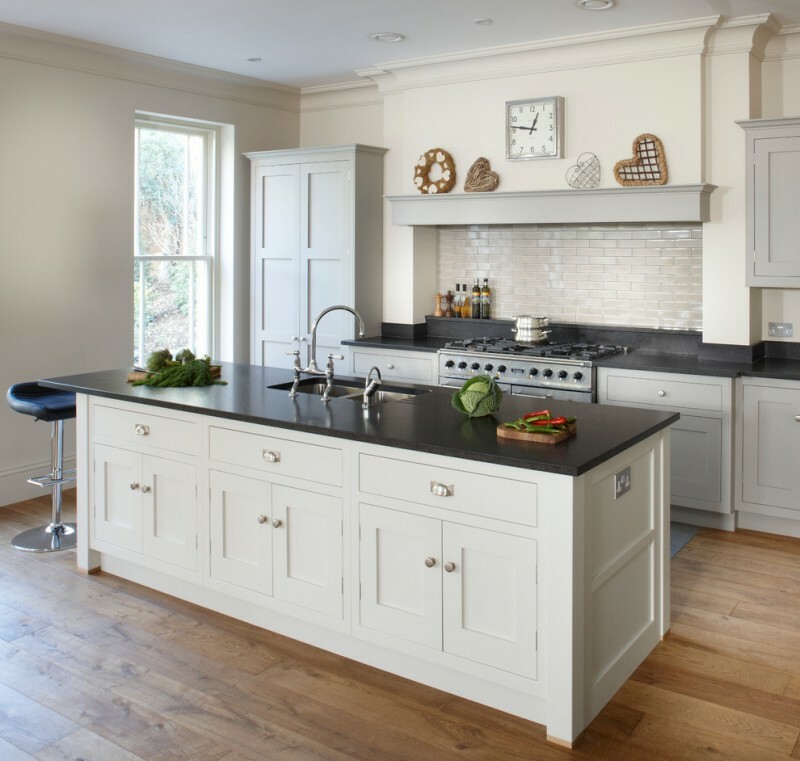 Still about white marble worktop for an kitchen island – this one is the example of expensive kitchen island which is designed in classic style. The island includes square-shaped undermount sink and cabinetry in grey. The whole design fits for light classic kitchen set. 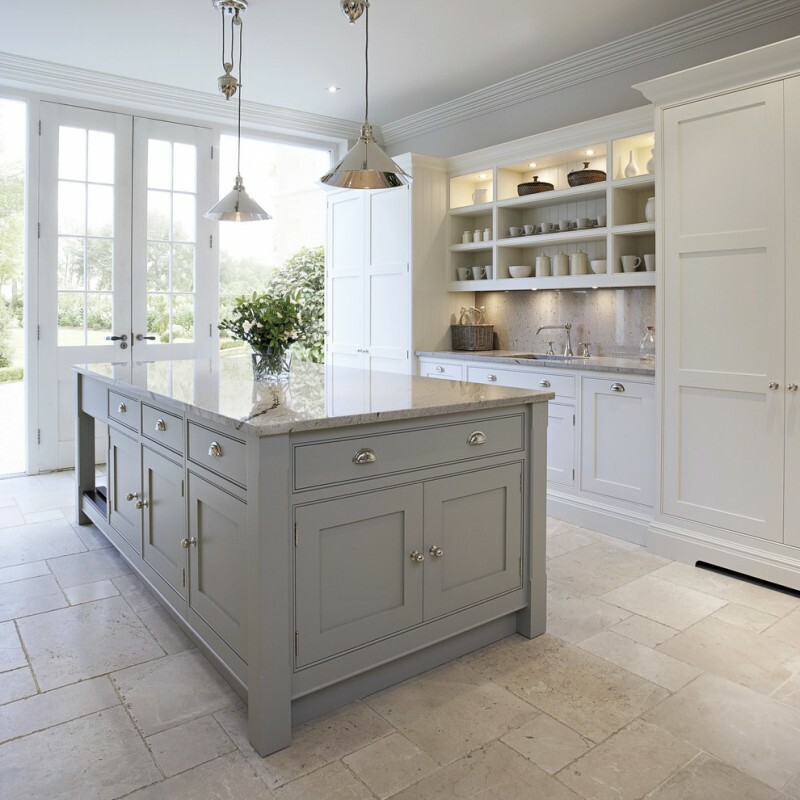 This idea of kitchen island exposes the worktop which is extended to a breakfast table. Such design, of course, provides huger space with dual functions: a prep. table and another is a dining table. Just add the extra seats for ultimate this spot. 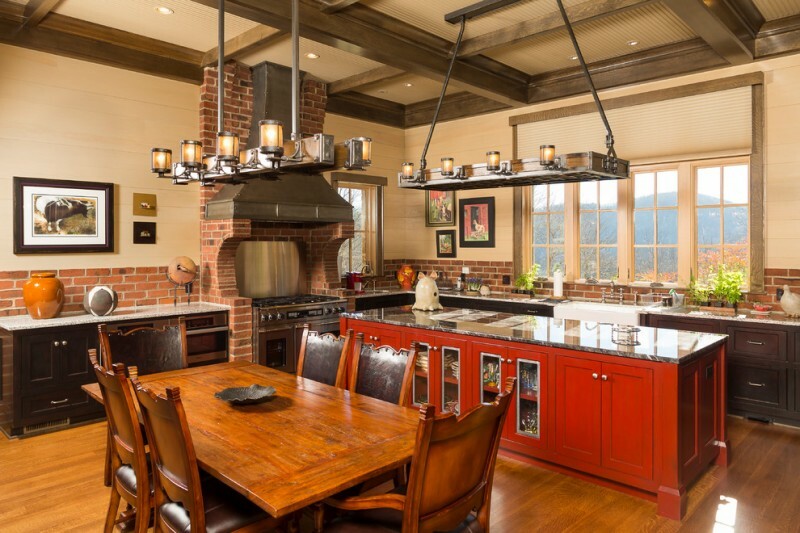 It’s a brilliant idea to mix modern interior design with rustic touch for a kitchen. 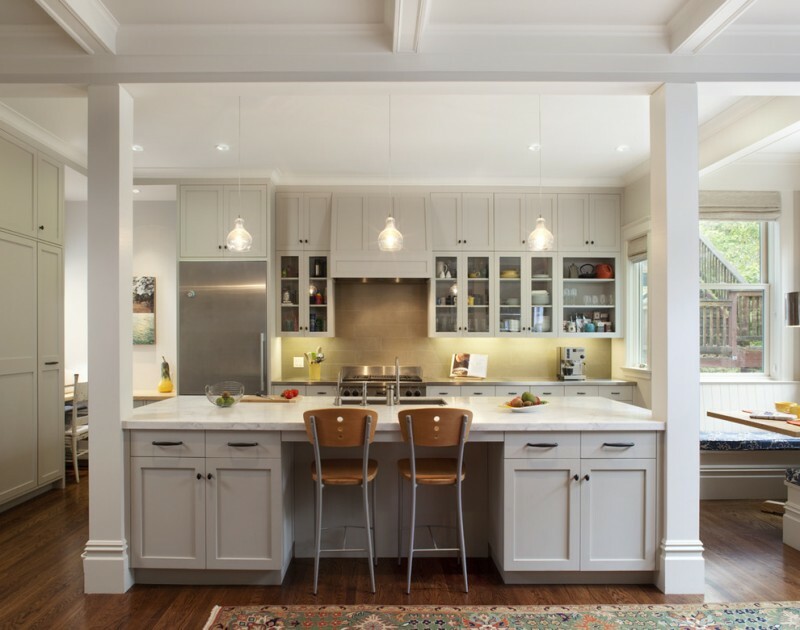 Like this idea, the designer has used unfinished wood kitchen island and kitchen cabinets as the room’s focal point. These two kitchen properties highlight the room which is dominated by modern white interior. The kitchen island, please observe carefully, has been featured with three units of drawer system as additional storage space. A couple of wood chairs also complement the kitchen island. 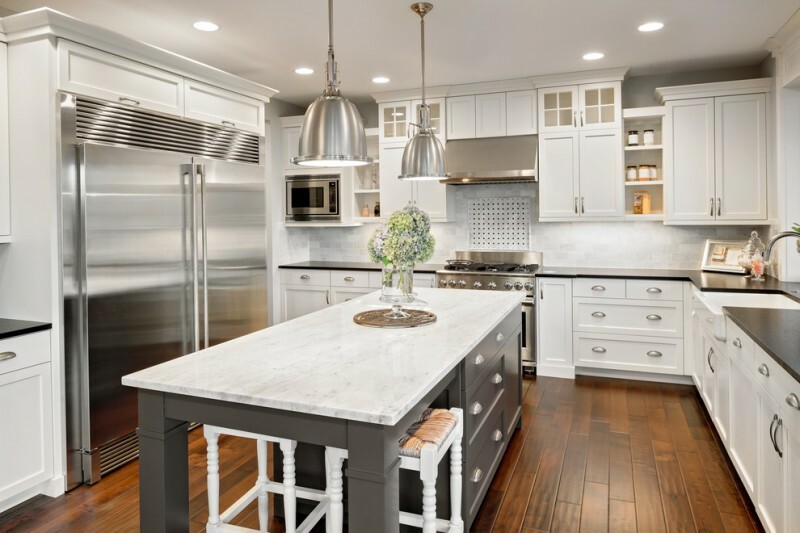 If you guys want to remodel your old kitchen into a neutral and light-toned one, use white and black as the primary tones. Create a contrasting look just by installing wide and dark wood-board floors. Make your log cabin much more completed just by building simple but functional kitchen. 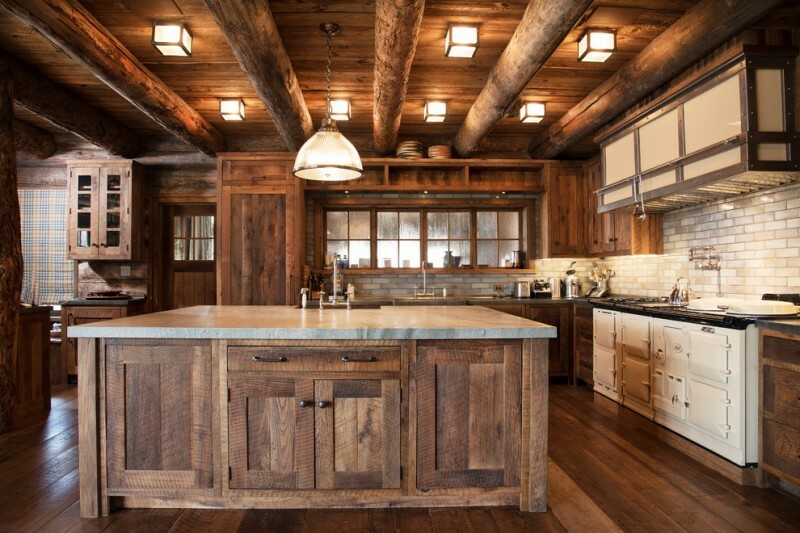 Use hardwood as the material and keep the original look of wooden to result a set of raw rustic kitchen. Add an extra storage on your kitchen island and use it for storing the cooking utilities or other items commonly used in cooking room. A country or farmhouse-style kitchen island with storage and chair addition – it can be said that this item is simple but full of functions. It can be used as prep. table and breakfast table at the same time. Pair it off with three or four country-style chairs as the extra seats. 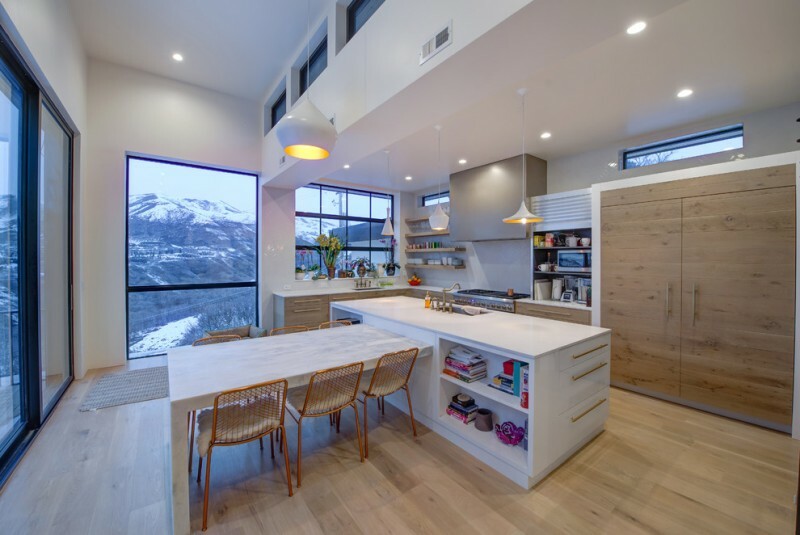 Kitchen island as well as eat-in kitchen design with glass-door cabinets, undermount sink, and granite countertop – the glass door covering the cabinets acts like a stylish & modern door panel that protects the stored items from dust or dirt. Compact-modeled kitchen island with open shelves & flat-panel cabinetry – a design offering simple, stylish, minimalist, but full of functionality. Such model actually suits any kitchen interiors, but contemporary or modern-minimalist are two-most-recommended ideas that suit this kitchen island. 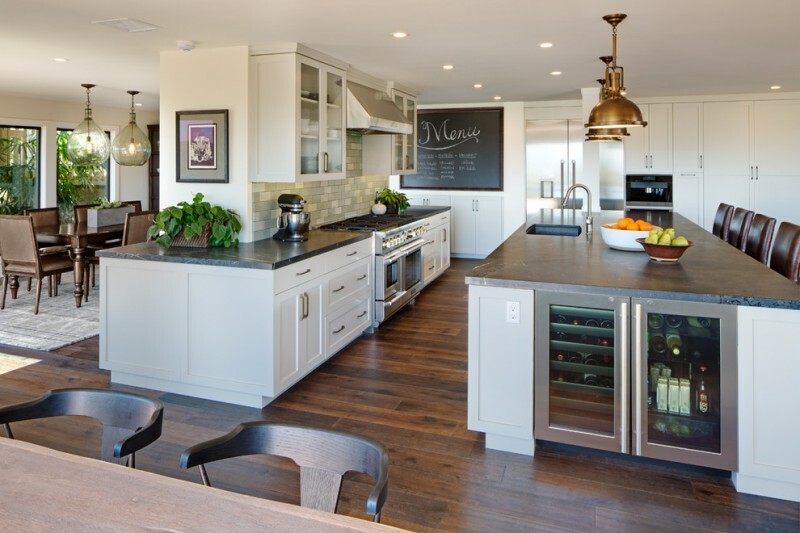 Both interior styles give a modern look, similar to what this island gives to. 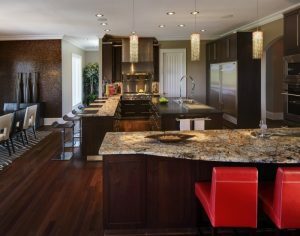 Large and dark solid toned-kitchen island with flat-paneled cabinetry and a couple of bowl sinks – its size accommodate more cook-activities than other common sizes. The whole body is covered by dark solid finishing, a contrasting color against wood that also stays strong and dominant in appearance. It’s lovely if we find how clean the kitchen is, including the kitchen island. 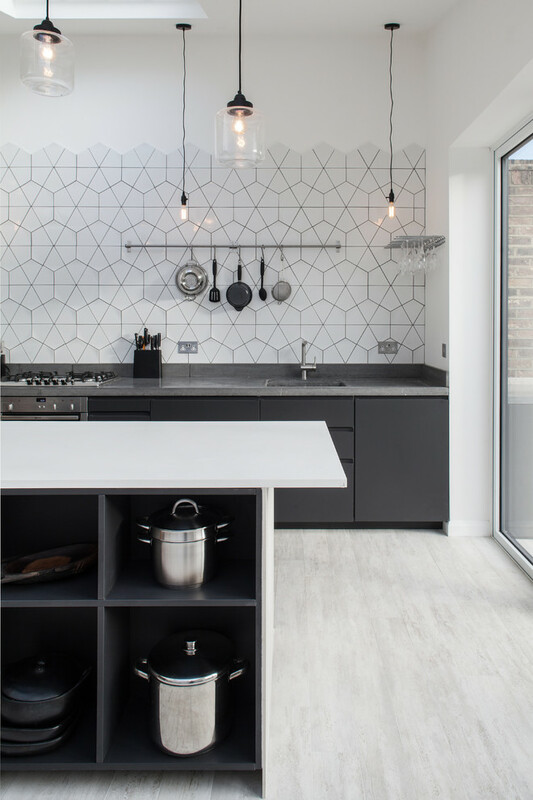 It looks so clean and simple as the designer uses white for the worktop and a contrasting tone like dark wood for the base which is attached with flat-panel cabinets. Clean and compact kitchen island, these two words represent this kitchen island idea. 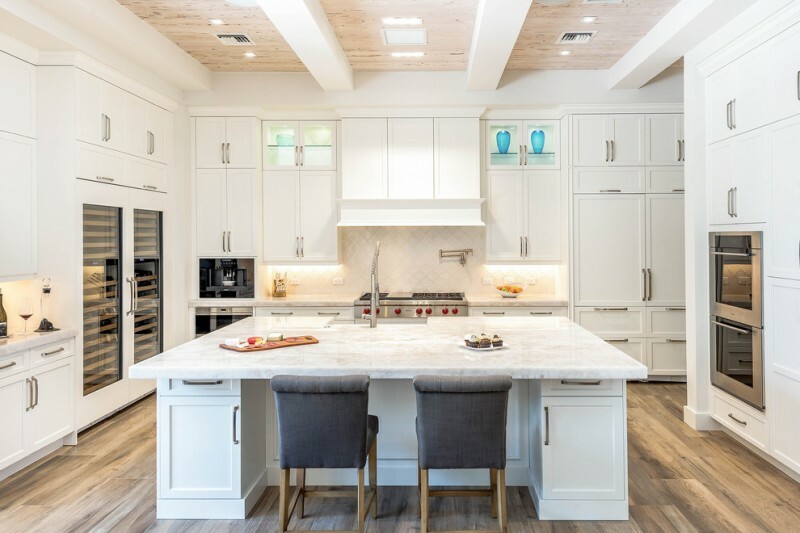 All elements of kitchen island is white and they’re designed in best precision of size and minimal patterns & color accents, making them tactile and luxurious. Modern stools which are built from light steels and red comforters also add modern touch to this room and avoid distracting the beauty of ‘horizon line’ of that kitchen island. 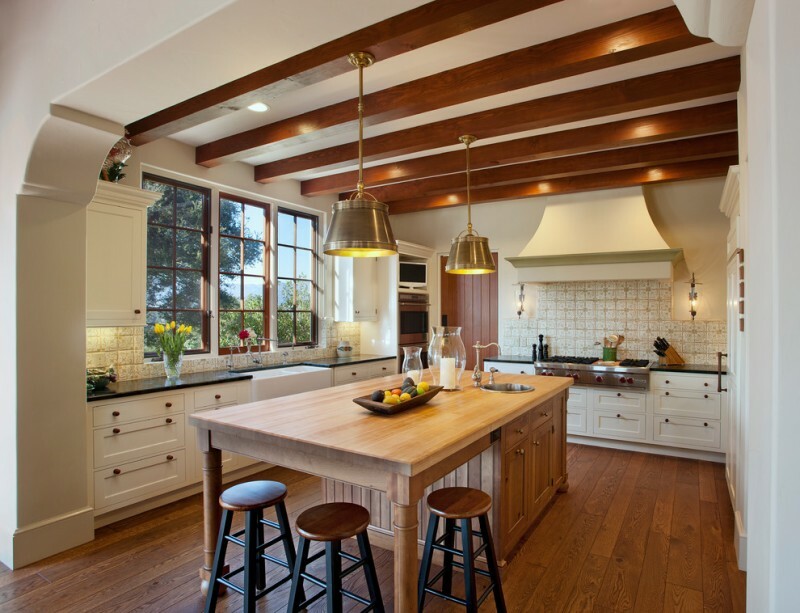 Get rustic to your kitchen just by using unfinished hardwood to your kitchen island. 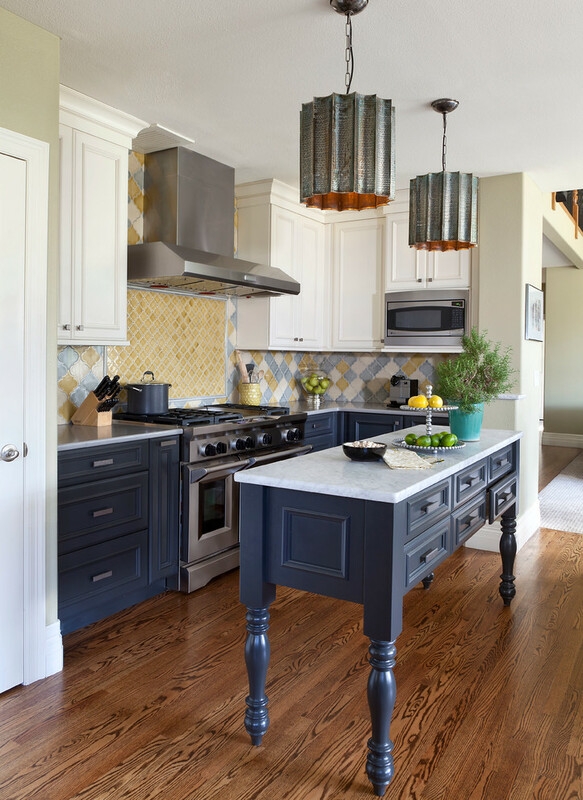 Add hard metal to optimize its look (using metal as the cabinets’ handles, perhaps) to emphasize the rustic look. Its granite top makes the kitchen island looks so elegant. 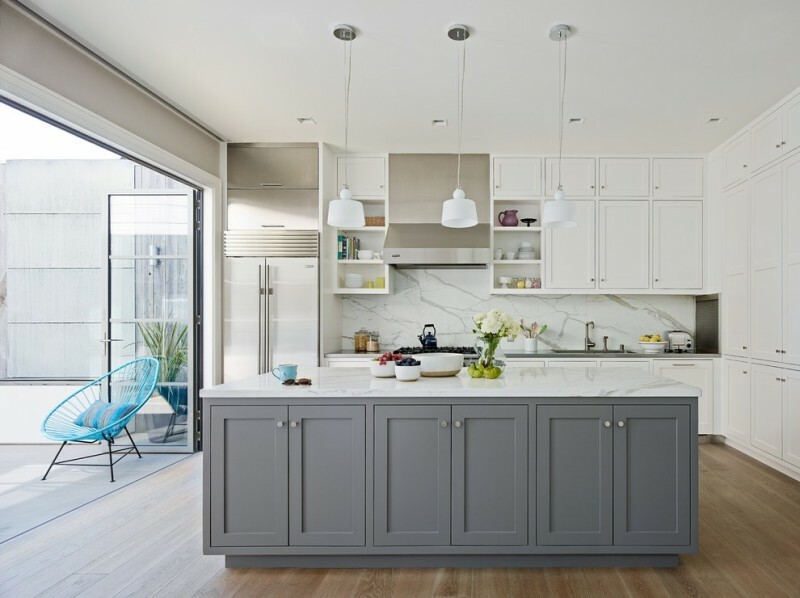 Pale grey cabinets attached on kitchen island aren’t merely the storage space, but they’re also involved in creating a balanced and harmonious tones of color applied on room. A chair addition here is a sign that the kitchen is able to be extended into a minibar table. A Mediterranean kitchen island idea with cabinet and chair additions – this is a good recommendation for you, the owners of Mediterranean-styled residence/ house. 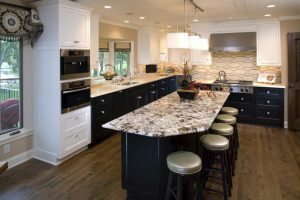 The island is supported with medium-sized undermount sink and faucet and several wood bar stools. The material of wood is still obviously exposed to keep it original, not fabricated. 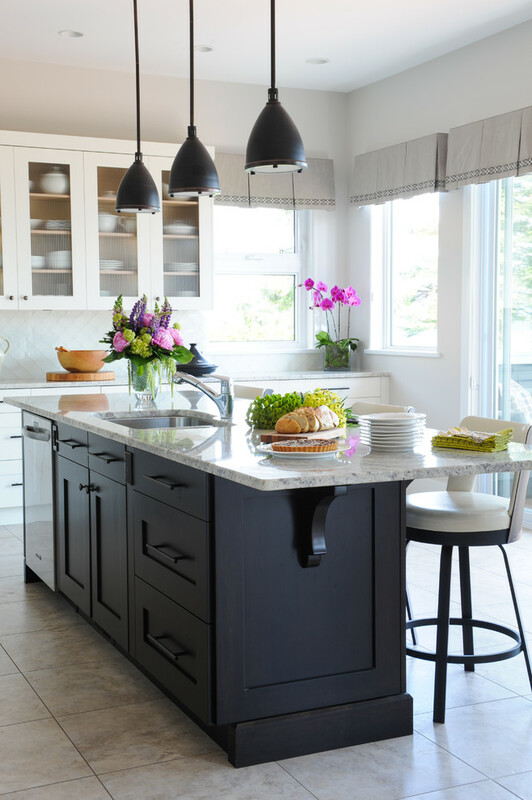 Monochromatic kitchen island – a great idea to collaborate white and dark (in this case: dark grey). The result is so amazing; it creates a simple, clean, and luxurious physic. Cabinet system is added to kitchen island with small buttons to make the users easier in opening the cabinets. These small buttons, also, act like the accessories of cabinets. 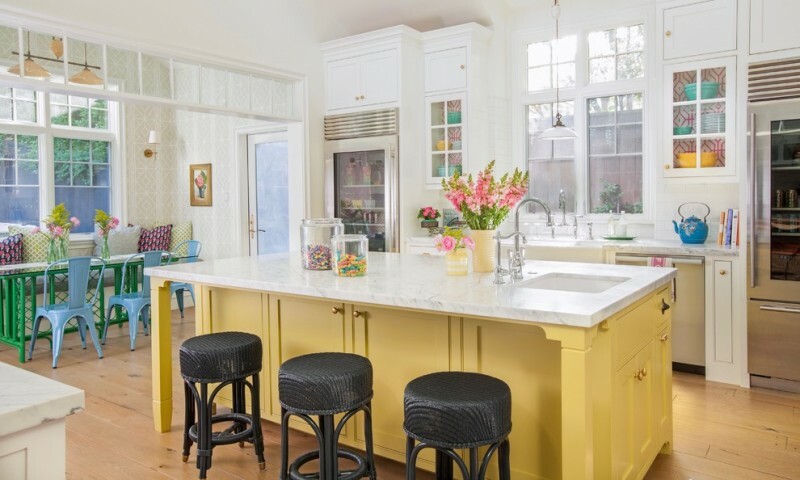 Use playful colors to pop up your kitchen – yellow for the kitchen island’s cabinets, for instance, and white for its worktop. Pair them off with another contrasting color for the chairs or stools. This idea surely gives special attractiveness to a kitchen. 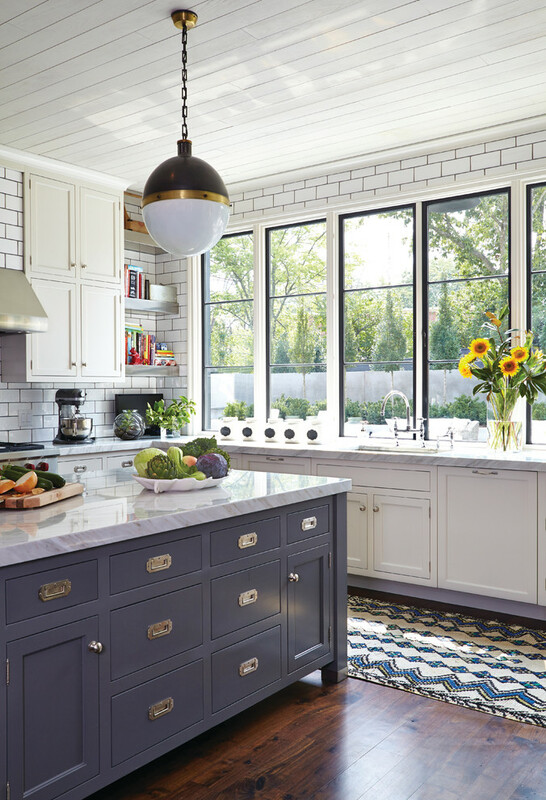 Blue is chosen as the tone of color that features with white color; this creates a beautiful contrast to this classic kitchen island. About the size, the island is designed in medium size, so it’s just available for single use: prep. table or serving table.